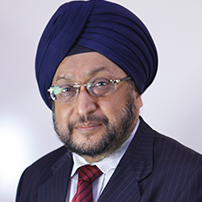 Mr. Kuljit Singh Popli is the Chairman & Managing Director of IREDA (A Govt. of India Enterprise), which is a pioneering developmental financial institution dedicated for financing of renewable energy and energy efficiency projects in India. The company has grown from strength to strength under his leadership. IREDA has also been carrying out notable work under CSR and sustainable development. Mr. Popli has rich experience of working over 35 years in Indian Power Sector. He has served with National Hydroelectric Power Corporation (NHPC) and Power Finance Corporation (PFC), prior to joining IREDA in 2007. Mr. Popli is also on the management board of several organizations of national importance and also official member of various high level committees set up by the Government of India in the field of Renewable Energy & Energy Efficiency. Mr. Popli is an Engineer by profession with added qualifications of Finance and Law. He is also Country Representative for International Solar Alliance – Affordable Finance at Scale. His contribution to the organization, profession and society at large has been recognized by various National & International agencies through conferring various coveted awards.